Designed for “Green” Environmentally Friendly Alternative Fuel Vehicles. Major heavy-duty truck manufacturers have developed engines that run on CNG (compressed natural gas) and LNG (liquefied natural gas). Methane is a potentially explosive by-product of LNG and CNG Fueled Engines. The Xintex® Methane Gas Detector / Monitor, Model S2B-M-X2-Display, constantly monitors the level of highly explosive methane and goes into alarm prior to a dangerous situation occurring. This advanced micro-processor, state-of-the-art Methane Gas Detector is incorporated into the design and re-design of vehicles using CNG or LNG as a fuel. Product Design: The stylish contemporary design of the Xintex Methane Gas Detector Monitor is ideal for installation into a dash, or similar panel. The 2 1/8” round housing, with 2 5/8” square bezel compliments the interior design of trucks and buses. Advanced electronic circuitry utilizes our exclusive digital signal, eliminating the necessity of purchasing proprietary cabling to sensors and panels. Equipped with Deutsch Connectors, with heat shrink and boots. Installation at the factory or aftermarket provides cost savings, versus competitive models. 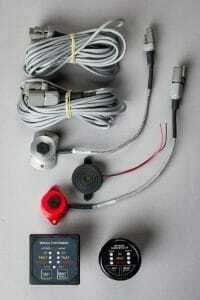 Standard 18 gauge insulated wiring may be incorporated into wiring harness. 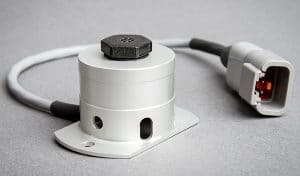 All connections are through Deutsch Connectors for a plug and play installation, thus saving costs and time at the factory. Aftermarket installations are made easy as heavy bulky proprietary cabling is not required. Optional Xintex wiring harness for sensors and remote status panels equipped with Deutsch Connectors are available at additional cost where desired. Xintex Methane Gas Detection Sensors are designed for specific reaction to elevated levels of methane and natural gas, while ignoring other hydro carbons, thus insuring faster response time and elimination of false alarms due to sulfated batteries, asphalt fumes on recently paved roads, elevated gasoline fumes from neighboring parked trucks, etc. When additional driver notification lights are desired to view Methane System Status from outside the cab. Applications include L.E.D. panels or L.E.D. panels in enclosures. The MRLE Series panels are in a metal enclosure with an adjustable mounting base. 85 dB Horn: Sounds at 50% of the L.E.L. Designed to accurately and quickly test Methane Sensors for reaction to elevated methane levels, with convenient rugged polycarbonate storage case. Connects to display panel to permit one additional sensor. Required when adding an additional Methane Sensor per zone. 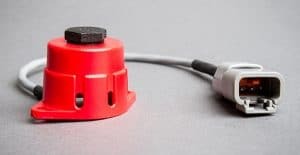 Equipped with Deutsch Connectors, with heat shrink and boots over connectors for trouble-free installations. Available with either square or round display. Other system kits available. Please contact Fireboy-Xintex for further information. NOTE: Methane Gas Detection equipment not available online. Please contact Fireboy-Xintex for design assistance.